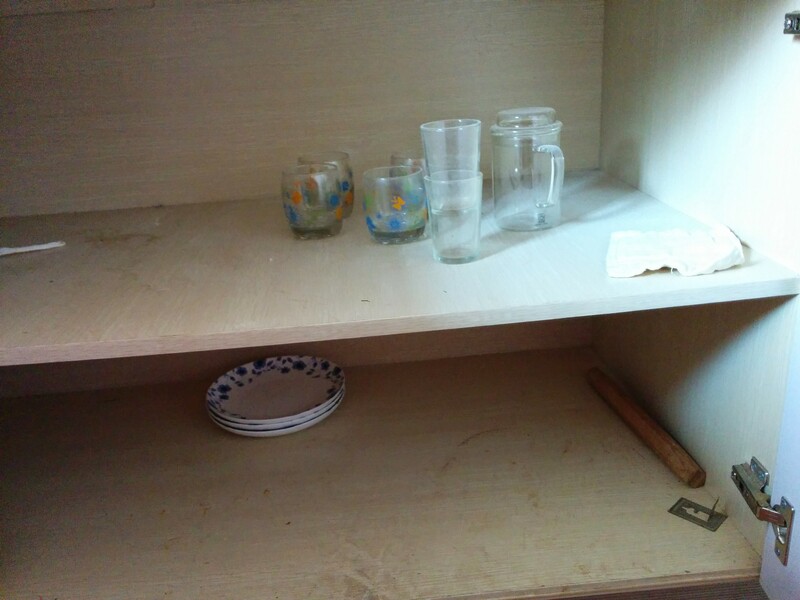 We’ve now rented umpteen different apartments in China, and we have found that they all have something in common: every one comes with a bizarre variety of crap left there from the previous tenants. The first place we lived, we were confused, then disturbed, as we uncovered more and more stuff in drawers and cabinets after we moved in. There was one drawer with a bunch of half-used traditional Chinese medicine, most of it stuck to the bottom of the drawer by the humidity of Guangxi. There were a few random dishes in the kitchen, and odds and ends in the bathroom, such as an almost-empty pack of cotton swabs. There was a used pair of pantyhose in the bedside table that is reigning champion for the title of Grossest Thing Left Behind. The pièce de résistance, though, we found by the bed. It was a framed picture of the couple who had just moved out. Why in the world would you leave a picture of yourselves when you move out of a place? Q-tips are easy to forget, but your wedding portrait? Was there some story behind it? Had they had a really big fight? Maybe they got a divorce? We could not figure it out, and it was a wee bit creepy. We struggled to find a logical answer for leaving the picture, or for leaving anything at all, for that matter. Many moves later, I think I’ve settled on this simple explanation: they just couldn’t be bothered. Honestly, Chinese renters don’t seem to care what they leave. They’ll get their security deposit back based on whether or not they have smashed holes through the walls, or stolen doors out of the apartment, not on whether or not they’ve remembered their hosiery. And so, we have come to expect a motley smattering of junk in every apartment, and we’ve never been disappointed. Broken window shades that don’t fit any window in the house, sectioned metal dishes that look like they came from a prison, orange cushion covers for a couch, and usually Chinese medicine in some drawer. So, it was no surprise to find a few treasures in the apartment we just moved into. 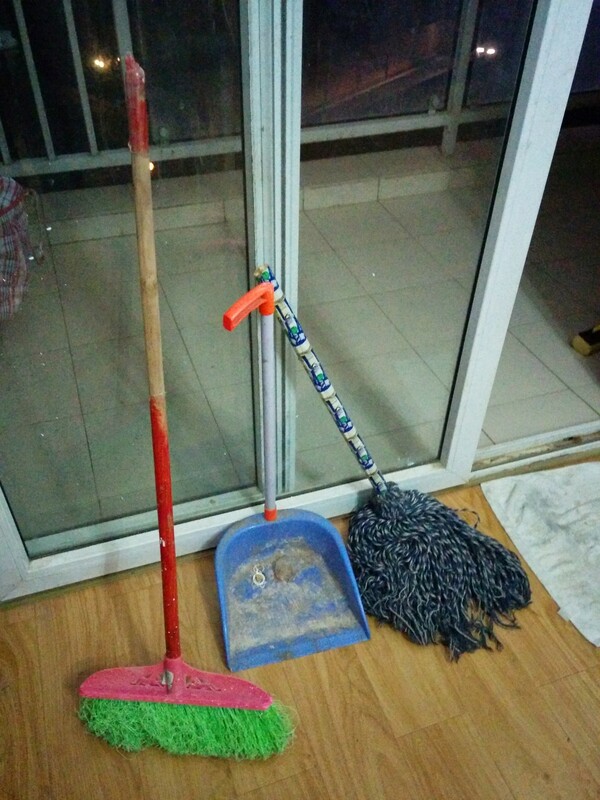 Barely functional broom, mop with a broken handle and strands falling out, wonky dustpan. I think these come standard with all Chinese apartments. It makes it easier for you to clean up the grime the other folks have thoughtfully left you to deal with. A couple colorful but cracked plastic trash cans to help with all that cleaning. 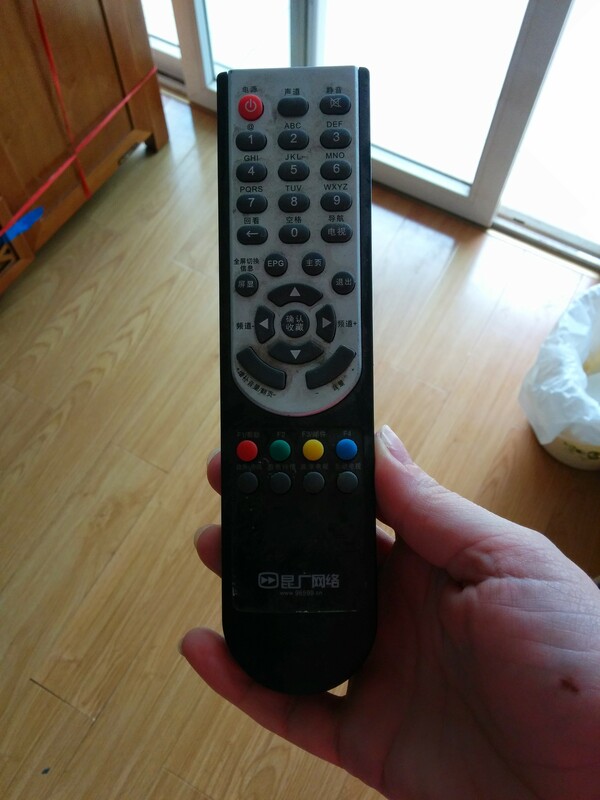 A remote that controls nothing. Always handy. Various glasses, dishes, and a rolling pin. Presumably for use until we get our own unpacked. 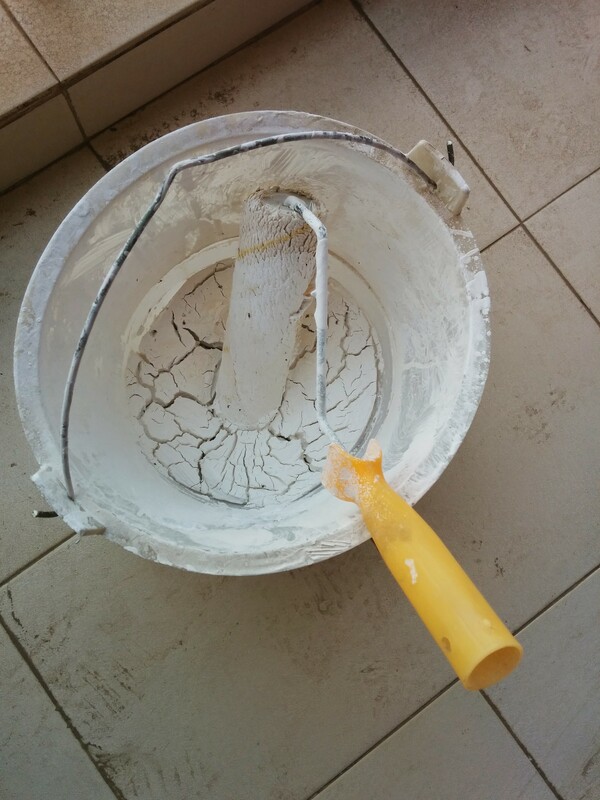 Completely dry and cracked bucket of whitewash with the roller cemented in it. Too much mafan to take this puppy out to the trash. I mean, too much mafan for them. Obviously, it’s a cinch for us to haul it. 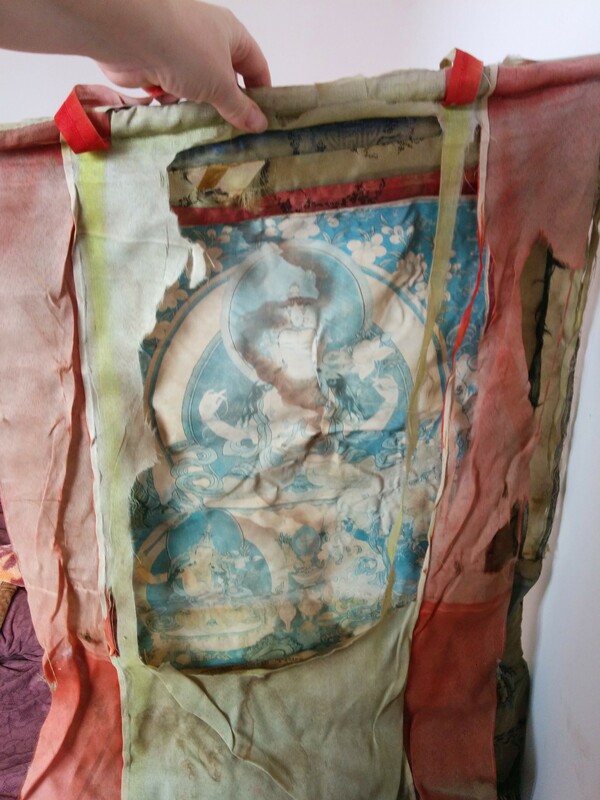 The crown jewel of this particular apartment is this Tibetan-style hanging banner that’s so dirty and faded I can barely make out the image, but I’m pretty sure it’s Guanyin, Goddess of Mercy. In the past, I used to neatly box up these items, fearing they might be the landlord’s, and he might want them back when we moved out. But I’ve been developing a callous as I’ve encountered more and more of these beauties, and I’m proud to say I’ve reached the point where I can nearly throw them out without guilt now. Bon voyage, Guanyin banner! May you have a happier life elsewhere. 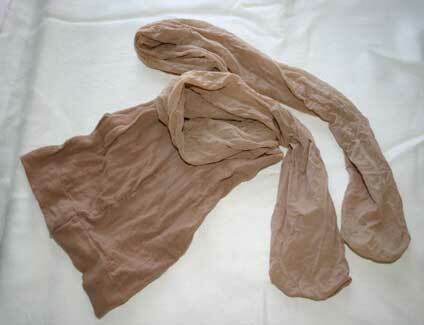 I hope you’re not reincarnated as pantyhose.